The Making of "Alien Song"
Blit Wizbok was born early in the summer of 1998. His genesis was more from necessity than inspiration. I was teaching myself character animation in Animation: Master on my spare time, and I didn't want to use any of the stock characters included on the A:M CD. I set about whipping up a quick character that would have a minimal amount of detail but would still allow me the range of expressions I had in mind. Thus it is primarily for matters of economy that Blit has only one eye and three fingers per hand; that means less to animate! I'm a sci-fi fan so the first idea that popped into my head was a "funny green alien". The design of the alien arose from the simple process of modeling him. His torso, head and "antenna" are the result of a single spline profile that I lathed and tweaked to taste. Then I shoved in arms, legs and an eye. I hid the seams with costume elements where necessary, and extruded into the head a rudimentary mouth. As modeling progressed I started sketching ideas to further refine the look of the character. The antenna turned out to be a good outlet for secondary motion and overlap, and I'm sure was inspired by the 3-eyed aliens in Toy Story. Since his modest inception Blit has undergone many revisions, but he remains quite close to the original spontaneous design. However, I have drastically refined his constraint setup, combining techniques of other artists with my own recipes. His current setup involves the use of two kinds of skeletons. The "Geometry" skeleton is comprised of the practical bones that make up the body (e.g. thigh, shin, foot, etc.). These are the bones responsible for deforming Blit's geometry as he moves. The "Control" skeleton is a separate, simpler set of bones which drive the motion of the underlying Geometry skeleton via constraints. The result is something like rods on a puppet, in that I can control the motion and placement of all the Geometry bones in the leg with just one or two Control bones, for example. The reward is fewer bones to animate, but more control and consistency of motion. Furthermore, the setup allows Blit's arms to switch from forward-kinematics to inverse-kinematics with a single Pose Slider. Another feature of Blit's constraint setup is that his head and chest do not inherit rotation from the hips, i.e. if I tilt his pelvis forward, the head and chest remain upright. This makes it easy to adjust one part of Blit's torso without having to counter-rotate everything above it. This is especially useful in the head because characters tend to lead their motions with the head, so it's a good idea to be able to control the head separately from the rest of the body. Most of these constraint techniques I use were developed for A:M by Raf Anzovin. As Blit's constraint setup has become more sophisticated, so have his textures and geometry. Initially the only image map he had was the one-eyed smiley face decal (I'd like to be able to take credit for inventing that, but I know I've seen it somewhere else before). The rest I left to group colors. He now has customized shaders to simulate spandex and latex in his outfit, and hand-painted image maps for the wrinkles in the lips, brow, elbows, hands and shirt. His eye also received special texturing attention, and the model was given the addition of a transparent lens to make it more "realistic". Since Alien Song I have also gone to great lengths to make Blit's body a single, unified mesh, rather than a torso with limbs stuck into it. This allows for better joint deformation in areas like the shoulders and hips. His facial articulation has been especially improved, and he is now capable of much more expression. Blit's name was an afterthought. 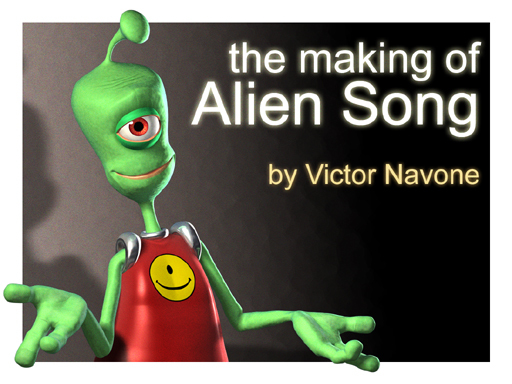 While in the middle of animating "Alien Song" I figured I had better come up with something to call him besides "my alien". I started jotting down lists of names that where phonetically interesting and had a cheesy, retro-sci-fi sound to them. I was in a game development meeting when I finally decided on "Blit Wizbok"; not coincidentally, "Blit" is actually a verb in computer graphics jargon. Incidentally, there has been some confusion over Blit's gender. Let me confirm that Blit is a "he", though he may have a penchant for the occasional drag routine.